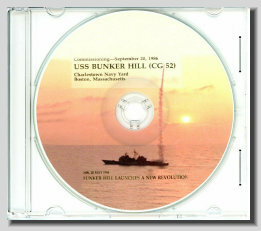 You would be purchasing the USS Bunker Hill CG 52 Commissioning Program. The pages are Hi-Resolution in Flip Book format with background Navy sounds. The pages can be magnified significantly. Designed for windows microsoft operating system. If you want a MAC version you will need to send us an immediate email after your purchase stating so. Each page has been placed on a CD for years of enjoyable computer viewing. The CD comes in a plastic sleeve with a custom label. Memos from the Top Brass. Commanding and Executive Office Bio's. Crew Listing (Name and Rank by State). Over 30 pictures Plus Individual Crew Photos on 87 pages.